How effective are marketing campaigns aimed at encouraging residents to support locally owned businesses? New research in Philadelphia yields encouraging results and finds that grassroots outreach can be more effective than paid advertising and negative press coverage is not necessarily a bad thing. In some of the first research to examine the effectiveness of buy-local campaigns, surveys in two Philadelphia neighborhoods, conducted at the end of a month-long pilot Buy Local Philly program, found that one in six people were aware of the initiative. Of those, 40 percent said they had been motivated to patronize an independent business as a result. In a separate survey, more than half of participating business owners said the program had had a positive impact on their business. The findings are encouraging given the limited duration of the initiative, said Leanne Krueger-Braneky, director of the Sustainable Business Network of Greater Philadelphia, which organized Buy Local Philly. SBN, which has a membership of more than 200 locally owned businesses, plans to build on the pilot program over the coming year and expand it to an ongoing, citywide initiative by the fall of 2006. For the initial pilot, SBN decided to concentrate its efforts on two neighborhoods—Old City and West Philadelphia—that have a strong independent business base, but are also seeing an influx of chains. They recruited 115 locally owned businesses in the two areas to participate at a cost of $25. The businesses received a package of Buy Local Philly campaign materials to use in their stores, including window placards, nametags for employees, stickers to highlight local products, tee-shirts, and flyers with “10 Reasons to Buy Local Philly.” The also received a how-to kit with simple suggestions for promoting the campaign, ideas for in-store events, and text to help explain Buy Local Philly to employees and customers. To get the message out, SBN set up tables at several neighborhood events, partnered with community groups to do door-to-door and other direct outreach, and ran ads in Philadelphia City Paper and on buses and bus shelters. Many of the ads featured striking black-and-white photographs of local business owners at their workplaces taken by Philadelphia photographer Will Terry. The photographs were such a hit that they will be featured in an exhibit this fall. 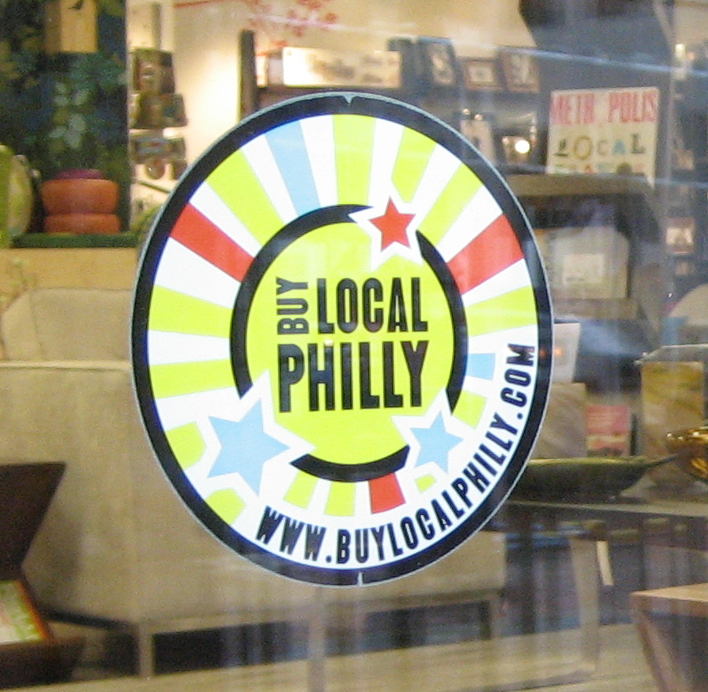 The initiative generated lots of local media coverage, including a scathing article by Philadelphia Inquirer columnist Andrew Cassel, who characterized Buy Local Philly as protectionist and designed for those elites who already find shopping at big-box stores “distastefully plebian.” His comments sparked a vigorous debate that was picked up in other news outlets. At the end of the month, SBN hired the firm Design for Social Impact to conduct a survey of 1,000 people in the two neighborhoods. They found that 17 percent were aware of the campaign and 7 percent said the campaign had encouraged them to patronize an independent business. Next in terms of impact was the press coverage. Of those who were aware of Buy Local Philly, many reported learning about the campaign through the media. That some of the coverage was negative did not prove to be a disadvantage. In fact, a number of respondents said Buy Local Philly had made a strong impression, because they disagreed with Cassel’s column. The effectiveness of the advertising trailed direct outreach and, in the Old City neighborhood, also press coverage. The bus shelter ads had more of an impact in West Philadelphia. As a result of the research, Krueger-Braneky said the upcoming holiday and citywide campaigns will emphasize grassroots outreach more than advertising. The research also revealed a need to encourage business owners to talk about the importance of locally owned businesses more with their customers. A survey of the participating businesses found that more than 90 percent would participate again, 57 percent said Buy Local Philly had had a positive impact on their business, and 21 percent reported an increase in sales. Building an awareness of the value of local ownership and being identified as a locally owned business were the primary reasons business owners decided to participate.